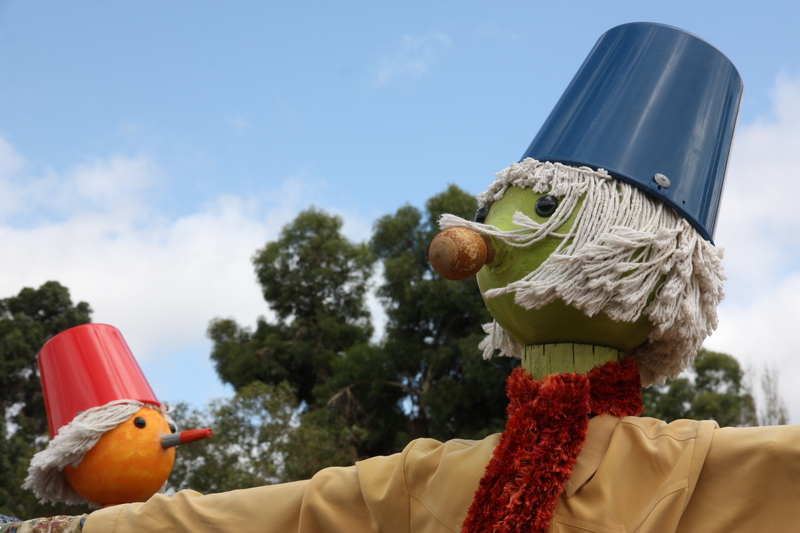 Not scared by the scarecrows of Balingup | Where to next? Balingup is a dynamic Western Australian community with lots happening—at least it seemed that way when we stopped. By car, the village is only 2 1/2 hours south of Perth and so a perfect place to have a ‘driver reviver’ stop if you are travelling to the famous Margaret River region. The colourful and cheeky scarecrows caught our attention first. We had to stop to inspect. These whimsical creations were scattered along both sides of the main road, and promoted the coming Small Farm Field Day. This annual event has been going since 1991. There’s a new theme every year and always a scarecrow competition. More importantly, it’s an opportunity for people from small local farms and cottage industries to exhibit and sell their produce. About 300 stalls squeeze into the local sports oval, and are host to more than 10,000 visitors each year. The village has other annual events such as the Medieval Carnivale every August. 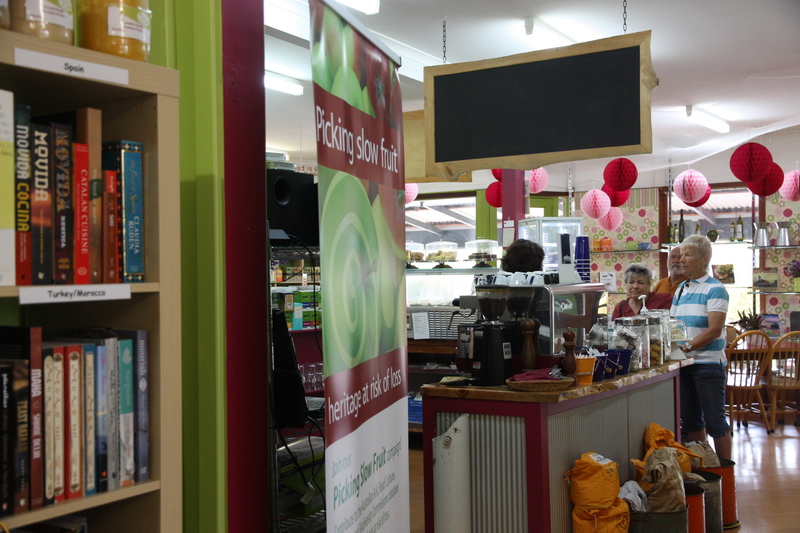 After ogling the scarecrows and popping into the tourist office, we made an assault on the local deli, Taste of Balingup. I was in heaven, starting with their impressive range of gourmet produce and wall of fantastic cookbooks. If I go that way again, I’ll sign up for one of their monthly cooking workshops. While Poor John and Kate enjoyed some lunch goodies, we had a chat with the owner/manager. We were sad to hear there had been a recent break-in, with money taken and unnecessary damage done to the place. The Village Pedlars was another colourful stop. What a lovely range of handmade gifts and fresh produce on display. 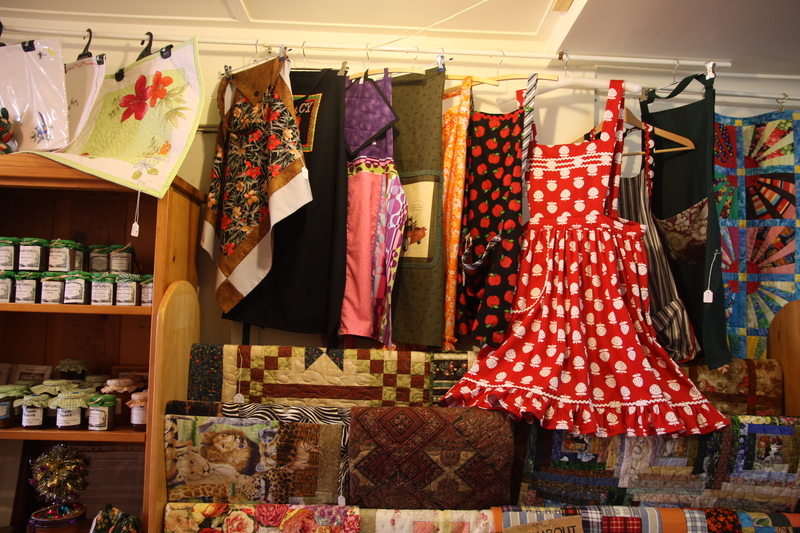 Some of the aprons were real showstoppers. We popped into the Tinderbox too, which has a range of herbal products. Have to confess I couldn’t stay long because the scents were too strong for me. Our last stop was at the Old Cheese Factory on the outskirts of town. It’s Western Australia’s largest art and craft centre, with lots of pottery, timber furniture and second-hand goods. Okay, I admit it. I bought two cookbooks there—at rock-bottom prices—that will feature in What’s cooking on page 32. I really enjoyed this. How much cheese did you buy? And congratulations on buying only two cookbooks! There must be a way to reward such restraint. And, if you have an opportunity to WordPress feedback about the site, I don’t like the advertising. I much preferred the other format. Funnily enough, the Old Cheese Factory doesn’t sell cheese anymore. But we did buy quite a bit of cheese at another place. Pity about the advertising. I’ll see if I can find a way to pass on your comment.